Our second day in Florence woke up early to go on an amazing food tour put on by Taste Florence. We met at La Norcineria, and old-school grocery and prosciutteria located a few blocks from the train station. The assortment of fresh and cured meats (with many prosciutti hanging from the ceiling) really puts the paltry selection of Italian meats we have access to at American grocery stores in perspective. Some other memorable stops on the tour were Forno Canapa di Braschi Ivana, the Mercato Centrale, and Enoteca Alessi. During the course of our food tour and on our way back to the apartment afterwards, there were still many good opportunities for candid street shots. I particularly liked the picture of the older gentleman waiting in one of the piazza's (though I must say he looked a bit grumpy). 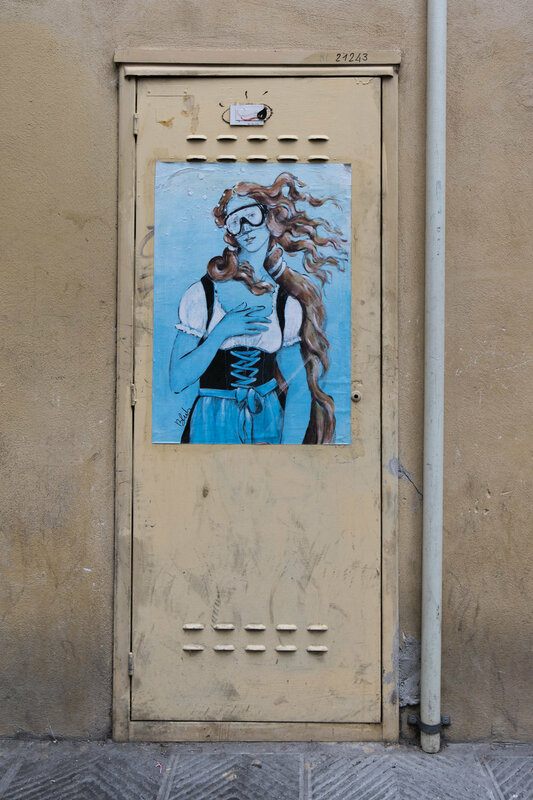 I also noticed a fair amount of interesting artwork on walls, doors, utility covers, and signs throughout the city. While probably technically graffiti, most of them in the downtown area were quite poetic in their contrast with the comparably old buildings and stone streets (though I can't say the same for the quality of the graffiti on the outskirts of the city). A few of my favorites are below. After a short rest back at the apartment, we headed back out towards the Ponte Vecchio to peruse some of the shops. The bridge really was a neat landmark, but the number of jewelry shops was a clear indication of the likely astronomical rent prices for such a prized location. 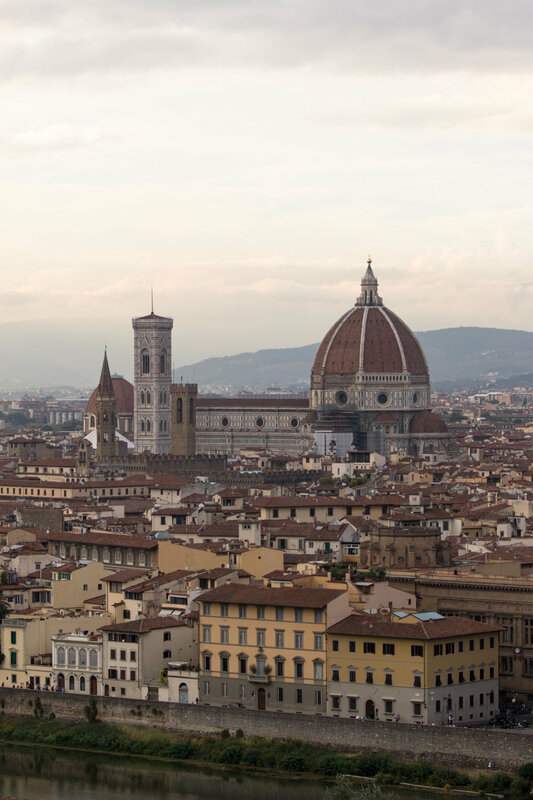 Looking back across the bridge, we could still see the dome of the Duomo over the crowded streets. 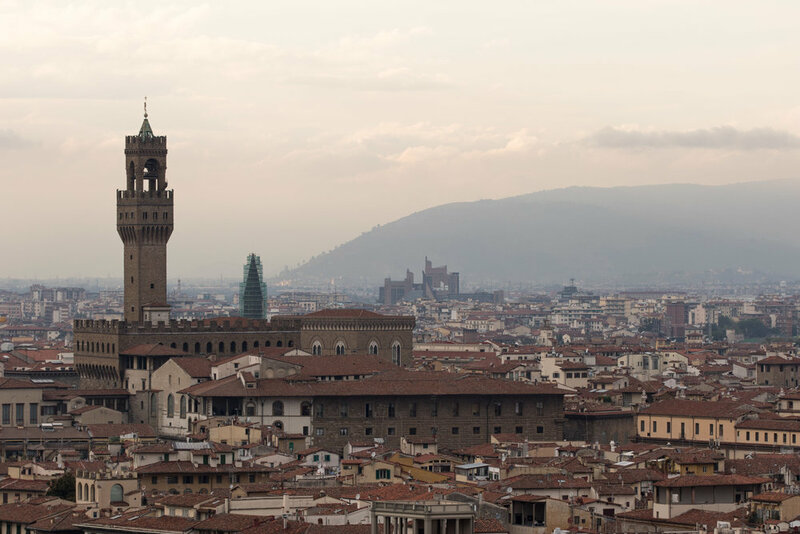 Once over the bridge, we headed back east towards the Piazzale Michelangelo, which offered a truly excellent view of the entire city. I made me wonder how many people 100, 200, even 500 years ago stood atop the same hill to admire the sights. As the sun was setting, we walked back down the hill, across the Ponte alle Grazie, and headed back for the night. That concludes the second day of the trip. Check back in soon for more posts!